I'm the first to admit that I'm not extremely happy with how our options are looking for the upcoming election. But for the love of all that is holy. Are you kidding me with this Spanish crap? If you can't follow the campaign in English, you shouldn't have the right to vote in the first place! I totally agree!!! I'm sure we'll be seeing those signs around here, if they're not up already!! We see too much of it here, no one in our office speaks spanish & we're waiting for the day we have to learn it, or they make it required. Right now, we make them speak english or call back with someone who can!! Actually, this particular phrase is one that the illegals are using to push for citizenship. I think this is more of what this sign is about, not using Spanish, but encouraging illegals to vote/become citizens with Obama's help. His stance on illegals and his stance on healthcare are two things besides the obvious--Iraq--that I just can't stomache. The Houston, TX school districts are proposing making teaching in spanish mandatory. NOT teaching spanish, but teaching all classes in spanish to us anglos and african-americans. If they can try to mandate our kids into speaking spanish, how come they can't make them learn english LIKE EVERY AMERICAN? That would be discrimination??????? 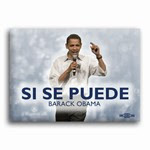 "Si se puede" was made famous by Cesar Chavez (a Mexican American, farm worker and civil rights activist/Union leader). I think Obama is using the phrase in his advertising to try and make himself more attractive to Hispanic voters by aligning himself with someone who is well respected by much of the Hispanic community. It's kind of interesting though- Chavez was against both illegal and legal immigration! It means, "Yes we can" and that's actually what bothers me more than the fact that it's in Spanish. I feel like this is just another empty phrase, leaving me asking, "Yes we can what??????" I'm afraid to know the answer....higher taxes, leaving Iraq....ugh. I'm pretty sure you're gonna hate if that clown becomes your hubby's boss.